BlackBerry overtakes iPhone in US web browser usage | BlackBerry Blast! A new report shows that RIM's BlackBerry overtook iPhone usage in terms of browser usage for the US market. 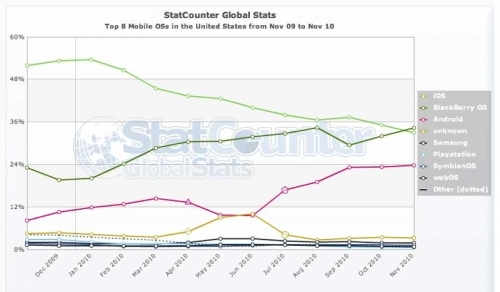 The numbers represent mobile browser usage in November and for the first time ever, BlackBerry is in the lead. StatCounter released the new data that shows BlackBerry ahead of the iPhone for the first time ever in November. BlackBerry had a 34.3 percent web browsing share while Apple had 33 percent. Android had 23 percent of the market. These numbers mean that developers should not only focus on the iPhone in terms of the US market. On the global market RIM isn't doing s well. Nokia is in the lead with 31.9 percent, Apple with 21.9 percent, and RIM at 19.3 percent.